Made with poly handle, super stiff nylon bristles and a tempered steel pick. Sturdy, easy to use. Popular 5 1/2" steel pick, with vinyl coated handle. Inexpensive brush for mane and tail. Thin teeth make it easy to use. 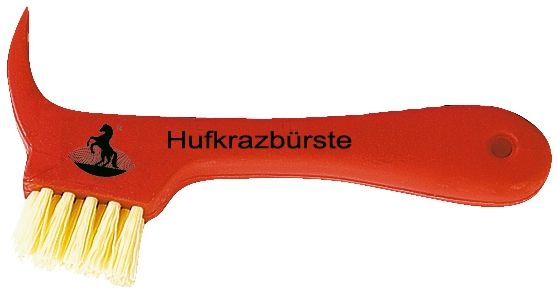 A unique grooming aid, designed to deep clean and massage your horse at the same time. Unlike imitations, its unique neoprene and polymer compound will not soften or be affected by skin oils or coat conditioner and polishes. The special design of the cleaning/massaging fingers will not allow dirt or hair build up in the Wonder Brush. Brush measures 4 1/2" in diameter with 3/4" cleaning/massaging fingers. 3 Available. Fine plastic teeth help remove dirt and dust as they massage the skin. 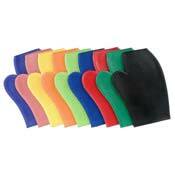 Supple plastic gives this curry bendable action for better comfort and contour to the horses body. Adjustable handle. Made smaller for children or small hands. Helps shampoo to lather and clean deep down. Massages and helps supple your horses' muscles. 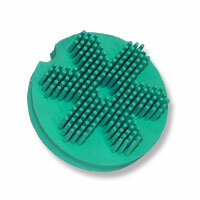 Two sided- nylon bristle for scrubbing and nubby surface for massaging and grooming. Curry comb made on a rubber mitt. Easier to use than a curry comb, fits on the hand for currying legs or sensitive areas of the horse. Eliminates loose shedding hair fast. Nubby surface on both sides. Can be used left or right handed, wet or dry. Great for pulling manes to thin them. Varnished wood back, 3” poly bristles. Longer bristles allow you to “flick” dirt away easier. Poly brush in great colors kids love. Stiff hardness. Poly back dandy brush with 2 3/4" poly bristles, 8” x 2 3/8" canoe shaped back. Back has some dirt but bristles seem clean, possibly unused. Name Gator written on side. Legends Black Knight Soft Dandy Brush is ideal for flicking away dust and dirt from your horse's body, legs and face. Ideal finishing brush. Soft, smooth 3" black poly fibers, 8 1/4” x 2 1/2” varnished wood back. New, but wood back & label are shop worn, bristles new/never used. Wood back small brush of horsehair or similar natural hair bristle, super for producing the ready shine for the show ring. Fine quality brush for the body, face & all delicate areas, or use as intended for shining shoes & boots. 3 /4" natural bristles, 5” x 1 1/2” wood back. Like new condition. Wood back small brush of horsehair or similar super fine soft natural hair bristle, great for producing the ready shine for the show ring. Fine quality brush for the body, face & all delicate areas, or use as intended for shining shoes & boots. 1 1/8" super soft natural slightly angled bristles, 4 3/4” x 1 1/2” at widest point shaped wood back. Very minor dirt to bristles, but wooden back has writing in marker on it. 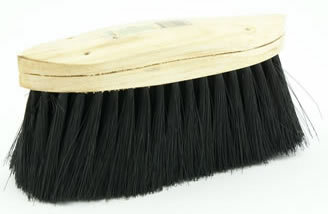 6” Poly Brush, poly back, 1 3/4” poly bristles. 1 Horse shaped Sponge-has some blue discoloration on it. Molded poly braiding comb with 2 finger holes. Great braiding aid for even spacing. Size 3 1/2" X 2 1/4". Wood back small brush of horsehair or similar super fine soft natural hair bristle, great for producing the ready shine for the show ring. Fine quality brush for the body, face & all delicate areas, or use as intended for shining shoes & boots. 1 1/8" super soft natural bristles, 4 5/8” x 1 5/8” at widest point shaped wood back. Wood back has stamped Salmon Products, England, FAC2, Made in Englnd. Very minor dirt to bristles, but wooden back has writing in marker on it. Pimpled grooming glove for pets can be hand or machine washed in cold water. Simply hang to dry after washing. Helps reduce shedding, perfect for keeping hair build up non-existent on furniture. Use on upholstery, bedding, clothing, and carpets. Grooming glove can be used on cats, dogs, & horses, as well as small animals such as ferrets, hamsters, guinea pigs, etc. Easier and more gentle than brushing. Glove can be used on left or right hand. Contains 1 glove. Plastic mane comb shaped like a horse. Fine toothed comb. Poly comb 8 1/2” long, strong teeth for mane or tail. Indispensable for bathing and removing ground-in dirt and stains. Stimulating & creates a "massaging effect" horses (and humans) really enjoy. Fast drying, will not mildew, durable & hygienic. To use just apply soap to wet Scrubby, wash, rinse & shake to remove excess water, then hang up to dry. 100% nylon. Removes loose hair, dust and dirt. Leaves horses coat slicker & shinier in minutes. Also great for removing hair from fleece & felt saddle pads, girths & horse blankets. Can be used on dogs & cats or other livestock. Poly shedding blade with a handhold at each end. Slightly flexible but very sturdy. Serrated teeth on 1 side are fairly sharp, so this is for use on shaggy animals with a thick hair coat, such as horses, cattle, alpacas, large breed wooly dogs, etc. Measures approx 24” long x 1 1/2” wide x 3/16” thick. Hole on both ends so easy to hang on a nail in the barn, wash bay, garage, etc. Double tempered, spring steel, fine-tooth double blade, other side smooth for sweat scraping and water removal. Can be used open or closed(one handed or two). Great for removing hair during shedding season. Strap for holding this closed is missing, otherwise excellent used condition. Another hard to find yet indispensable item. Remove nasty bot eggs (those little yellow dots you see in the fall) from your horse's legs and body. Blade is stainless steel, poly handle. Excellent like new condition, may even be new, but slightly dirty. Kass Forge Speedy Pull Thru Braiding Tool Braiding Aid Pull Through Braid 3 Pk. This braiding tool is designed to never leave your finger as you are tying the mane down. Slip yard through “eye” of needle & pull through for neat braids every time. 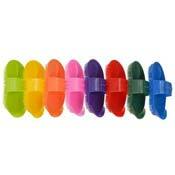 Comes in handy 3 pack of brightly colored braiding tools. Bright colors make it harder to loose in bedding, etc. Super strong. Easy to use. Great for braiding or banding manes. 500-600 pcs. per package. Reusable tubes for perfect braids. No need for tape. Quick on & off. Use over & over. Makes every braiding job look clean & uniform. Great for the Dressage show ring! Set of 20. This basic braiding kit offers a convenient suede pouch to store your seam ripper, mane comb, yarn puller and hair clip. Great for show braiders to keep all your tools in one place. 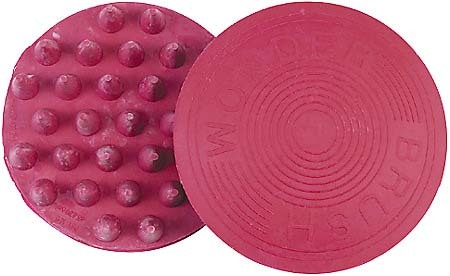 Round synthetic tack sponges are ideal for cleaning small places, washing horse faces and for general tack cleaning. Measures 2 3/4" round. Great for children or small hands. Rinse and reuse. Sold individually. 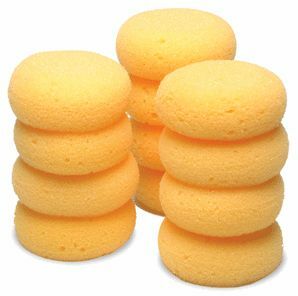 Rectangular synthetic tack sponges are ideal for cleaning small places, washing horse faces and for general tack cleaning. Measures approx 5 1/2" x 2”. Great for children or small hands. Rinse and reuse. Sold individually. 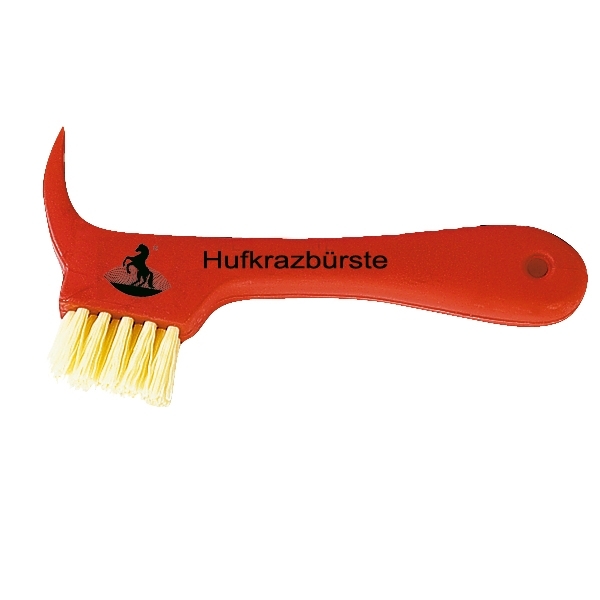 All plastic construction, poly handle with pick, super stiff nylon bristles. Flexible poly sweat scraper with a textured handhold at each end. Great for removing excess sweat or water at bath time. Measures approx 24 1/2” long x 1 1/2” wide & is angled on both sides of blade for use in either direction. Hole on both ends so easy to hang on a nail in the barn, wash bay, garage, etc. Flexible poly sweat scraper with a handhold at each end. Great for removing excess sweat or water at bath time. Measures approx 33” long x 1 1/2” wide. Hole on both ends so easy to hang on a nail in the barn, wash bay, garage, etc. 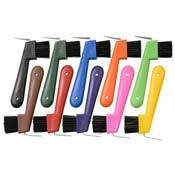 Deluxe hoof pick with soft grip and brush, made with poly handle, super stiff nylon bristles and a tempered steel pick. 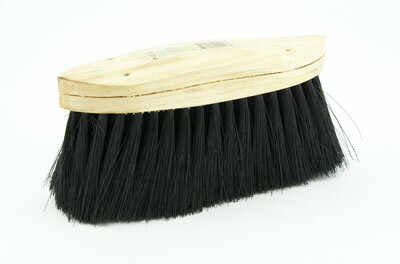 Natural bristle brush with poly handle. Great for applying hoof dressing. New, never used, but cover got lost. Natural Tampico bristles that gently smooth your horse's coat and add shine. The wooden block is grooved for a comfortable hold. Made of premium quality materials according to high workmanship standards, this brush is good for general grooming or finishing. 2” natural bristles, 7 1/2” x 2 3/8” wood back. Good used condition with some dirt. 2 available. 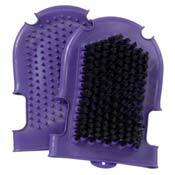 For horses (and horse keepers) who have always hated combs. This sturdy ultra-wide-tooth comb weaves it's way gently through mane and tail, separating, detangling, leaving hair healthy and flowing. 9 1/2” x 2 1/2”, teeth spaced approx 3/8” apart. 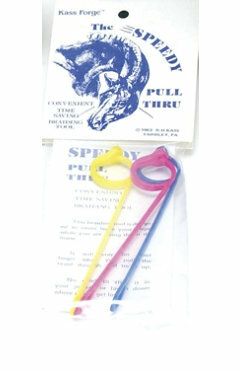 Add your own string to the end to make easy to grab & hang on a peg. Soft and gently cleans while massaging the horse's coat to enhance shine. Perfect for the face, legs, stomach or other sensitive areas. Palm-sized, measuring approximately 3 3/4" in diameter. 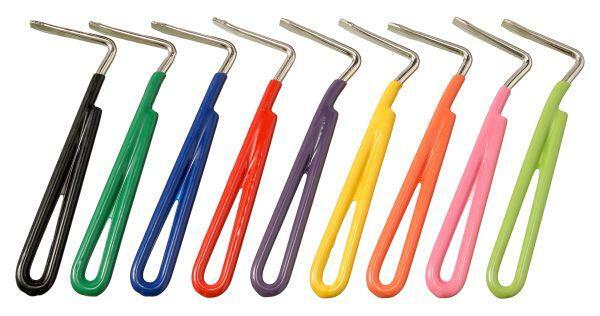 204 soft, flexible rubber fingers easily remove dirt, mud and loose hair while being absolutely safe for use around the eyes and ears. Also quickly removes dirt and loose hair anywhere on the body. Easy to hold and great for shampooing too. New, original tags attached, but slightly dirty tops from shop handling & vending at outdoor shows. Natural bristles that gently smooth your horse's coat and add shine. The wooden block is grooved for a comfortable hold. Made of quality materials, this brush is a medium soft & good for general grooming or finishing. 2” natural bristles, 8 1/4” x 2 3/4” wood back. Not marked as to brand, should be a Wright's brush, or similar quality. Good used condition with some dirt. 2 available. Poly bristle brush with black poly handle. Great for applying hoof dressing. Overall length approx 4 1/2“. Helps shampoo to lather & clean deep down. Massages & helps supple your horses' muscles. Can be used left or right handed, wet or dry. Made of a swirled poly vinyl. Brand unknown but has imprint of a horse head on it. Some trapped dirt otherwise clean.